Please see PaDIL (Pests and Diseases Image Library) Species Content Page Non-insects Giant African Snail for high quality diagnostic and overview images. 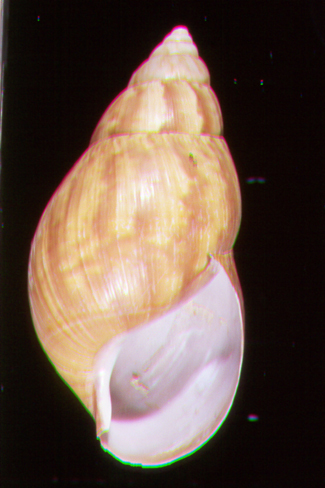 The Achatinidae gastropod family is native to Africa. The family is represented by about 200 species in 13 genera (Raut & Barker 2002). Several species of Achatinidae have attained pest status within their native range when the habitat has been anthropomorphically modified as a crop system including A. fulica (Raut & Barker 2002). 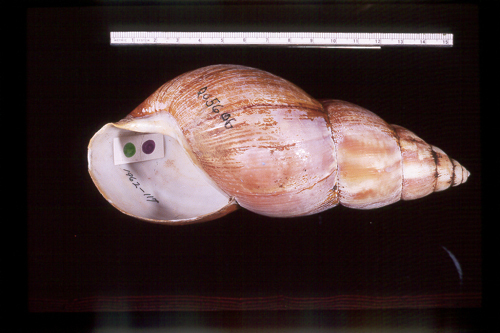 Within the Achatinidae , four species are classified as giant African snails: Achatina achatina, A. fulica, Archachatina marginata, and Limicolaria aurora (Smith and Fowler 2003, in Venette & Larson 2004). Some island systems appear to be resistant to invasion by A. fulica. The low abundance of A. fulica on some Pacific atolls may be due to the sandy soils and predation by hermit crabs (Coenobita perlatus and Birgus latro) (Schotman 1989, in Raut & Barker 2002). The omnivorous crab Gecarcoidea natalis provides biotic resistance to invasion by A. fulica on Christmas Island (Lake and O’Dowd 1991, in Raut & Barker 2002). Meyer and Shiels (2009) hypothesise that reduction or eradication of Rattus rattus populations may cause an ecological release of some nonindigenous snail species where these groups coexist. As such, effective restoration for native snails and plants may not be realised after R. rattus removal in forest ecosystems as a consequence of the complex interactions that currently exist among rats, nonindigenous snails, and the rest of the food web. Eggs hatch in anything from a few hours to 17 days. Snails mature at around 5 to 15 months, depending on the temperature (with cold winter temperatures inducing hibernation and delaying sexual maturity). Achatina fulica lifespan can be up to 9 years, with 5-6 years being the norm (Mead 1961) (Raut and Barker 2002). A. fulica has an economic importance as a medicinal and protein source (Muniappan 1990). With the emergence of Achtinidae as a tradable edible product captive breeding has been established for various species including A. fulica around the world (Mead 1982, Upatham et al. 1988, Runham 1989, Monney 1994, in Raut & Barker 2002). Considerable amounts of Achatina meat are exported to Europe and America from Taiwan, China and other Asian countries (Mead 1982, in Raut & Barker 2002). Interest in A. fulica as an edible snail has lead to its establishment in regions of Brazil, such as Sao Paulo, Rio de Janeiro, Minas Gerais, Parana and Santa Catarina (Teles et al. 1997, J. Coltro pers. comm. 2000, in Raut & Barker 2002). In addition to farming for meat, several species of Achatinidae, including A. fulica, are maintained in temperate regions outside Africa as laboratory animals (eg: Nisbet 1974, Plummer 1975, in Raut & Barker 2002). All of the countries in which Achatina fulica is established have tropical climates with warm, mild year-round temperatures and high humidity (Venette and Larson 2004). The species occurs in agricultural areas, coastal areas and wetlands, disturbed areas, natural and planted forests, riparian zones, scrublands and shrublands, and urban areas (Moore 2005). These snails thrive in forest edge, modified forest, and plantation habitats (Raut and Barker 2002). Wherever it occurs, the snail keeps to the hot lowlands and the warm temperate lower slopes of the mountains. It needs temperatures well above freezing year round, and high humidity at least during part of the year, the drier months being spent in dormant aestivation. It is killed by sunshine (Venette and Larson 2004). A. fulica remains active at a temperature range of 9°C to 29°C, and survives temperatures of 2°C by hibernation and 30°C by aestivation (Smith and Fowler 2003). Achatina fulica is an obligate-outcrossing hermaphrodite, which means that one externally fertilised snail can establish a population (Smith and Fowler 2003). . A. fulica produces large eggs that are 4.5mm to 5.5mm in diameter and only hatch at temperatures above 15°C (Srivastava et al. 1985). Snails begin laying eggs at six months of age and fecundity lasts approximately 400 days (Smith and Fowler 2003). Snails lay up to 100 eggs in their first year, and up to 500 in their second year; fecundity declines after the second year, but snails may live up to five years with a total egg clutch of up to 1 000 (Raut and Barker 2002). Achatinidae are generally regarded as herbivores, feeding primarily on living and decaying vascular plant matter (Raut & Barker 2002). The location of food by A. fulica is powered by its sense of smell, being mainly attracted to garden crops (Farkas & Shorey 1976, Gallois & Daguzan 1989, in Albuquerque et al. 2008) and species used as refuge needs. Van Well (1948 1949, in Raut & Barker 2002) reported that young A. fulica feed on decaying matter and unicellular algae. The major requirement of hatchlings is calcium until their shell reaches the 5mm size (Mead 1961, Mead 1979). Animals with shells between 5 and 30 mm in height were observed to prefer living plants (Raut & Barker 2002). Although not entirely neglecting living vegetation, the maturing snails were found to largely return to a scavenging detritivorous habitat (Raut & Barker 2002). While A.. fulica is mainly vegetarian there is recent evidence that it can also act as a predator of other snails (Meyer et al. 2008, in ). Achatina fulica has a remarkably broad range of host plants on which it feeds. Young A. fulica appear to prefer soft textured banana (Musa), bean (Beta vulgaris) and marigold (Tagetes patula). As the snail matures its dietary preferences broaden to include a larger variety of plants, including brinjal (Solanum melongena), cabbage and cauliflower (Brassica oleracea v. capitata and botrytis), lady’s finger (Abelmoschus esculentus), sponge gourd (Luffa cylindrica), pumpkin (Cucurbita pepo), papaya (Carica papaya), cucumber (Cucumis sativus) and peas (Pisum sativum) (Raut & Ghara 1989). Review: Review of updates under progress. 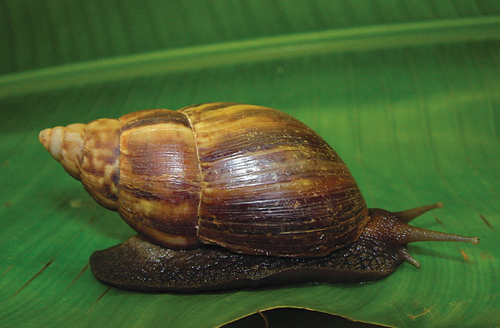 Recommended citation: Global Invasive Species Database (2019) Species profile: Achatina fulica. Downloaded from http://www.iucngisd.org/gisd/species.php?sc=64 on 19-04-2019. For a detailed account of the environmental impacts of A. fulica please read: Achatina fulica (Giant African Land Snail) Impacts Information. The information in this document is summarised below. Achatina fulica is considered one of the worst snail pests of tropic and subtropic regions. While their small size limits the quantity of plant material consumed per animal the aggregated nature of the infestations can lead to severe damage in infested plants (Raut & Barker 2002). The process of naturalisation may ameliorate the impacts of this invasive species. Mead (1979a) expressed the opinion that “...the phenomenon of decline in populations of Achatina fulica appears to be inevitable”. Agricultural: In tropical agriculture the cost of A. fulica is fourfold. First there is the loss of crop yield caused by herbivory. Secondly, damage may be caused by the spread of disease through the transmission of plant pathogens. Thirdly, there is the cost associated with the control of the pest and, finally, there are the opportunities lost with enforced changes in agricultural practice such as limiting crops to be grown in a region to those resistant to snail infestation (Raut & Barker 2002). For a list of “Economically important plants recorded as being subject to losses through damage by Achatina fulica Bowdich (Achatinidae) in regions outside of Africa” please see the full Impacts document. Irrespective of crop the seedling or nursery stage is the most vulnerable stage. In more mature plants the nature of the damage varies with the species, sometimes involving defoliation and in others involving damage to the stems, flowers or fruits (Raut & Barker 2002). Economic/Livelihoods: In the US state of Florida it has been estimated that A. fulica would have caused an annual loss of USD 11 million in 1969 if its population had not been controlled (USDA 1982). In India it attained serious pest status, particularly in 1946/1947, when it appeared in epidemic proportions in Orissa and caused severe damage to vegetable crops and rice paddies (Pallewatta et al. 2002). Disease Transmission: A. fulica distributes in its faeces spores of Phytophthora palmivora in Ghana; P. palmivora is the cause of black pod disease of cacao (Theobroma cacao); the oomycete which also infects black pepper, coconut, papaya and vanilla (Raut & Barker 2002). A. fulica spreads P. colocasiae in taro and P. parasitica in aubergine (Solanum melongena) and tangerine (Citrus reticulata) (Mead 1961 1979a, Turner 1964 1967, Muniappan 1983, Schotman 1989). Ecosystem Change:Costs to the natural environment may include (Raut & Barker 2002) herbivory; altered nutrient cycling associated with large volumes of plant material that pass through the achatinid gut; adverse effects on indigenous gastropods that may arise through competition; and indirect adverse effects on indigenous gastropods that may arise through control of the snail (eg: biological control with the rosy wolfsnail (Euglandina rosea) or use of chemical pesticides applied against achatinids. Human nuisance: A. fulica are also a general nuisance when found near human habitations and can be hazardous to drivers, causing cars to skid. Their decaying bodies release a bad odor and the calcium carbonate in their shells neutralises acid soils, altering soil properties and the types of plants that can grow in the soil (Mead 1961). Human health: In many Asian, Pacific and American societies A. fulica may play a role in the transmission of the metastrongylus causative agents of eosinophilic meningoencephalitis (Angiostrongulus cantonensis and A. costaricensis). For a detailed account of management strategies A. fulica please read: Achatina fulica (Giant African Land Snail) Management Information. The information in this document is summarised below. Preventative Measures: As there is a high risk of Achatina fulica being spread via trade routes there is potential to prevent its spread through international quarantine and surveillance activities. Small incipient populations of A. fulica have been eradicated at various times from California, USA; Florida, USA; Queensland, Australia; Fiji; Samoa; Vanuatu and Wake Island (Abbott 1949, Mead 1961 1979a, Colman 1977 1978, Muniappan 1982, Waterhouse & Norris 1987, Watson 1985, in Raut & Barker 2002). Control costs can range from USD 60 000 dollars for a 7-month procedure, to over USD 700 000 dollars for the eradication in Florida (Muniappan et al. 1986, Smith and Fowler 2003). For the few species in which spontaneous collapse has been repeatedly observed such as A. fulica, the possibility of such an event is warranted as a potential rationale for a do-nothing approach to management (Simberloff & Gibbons 2004). Physical Control: Collection and destruction of the snails and their eggs has been reported to be effective in Guam, Hawaii, Japan and Sri Lanka, Australia, USA (Peterson 1957c, Mead 1961 1979a, Olson 1973, Colman 1977, in Raut & Barker 2002). Physical barriers that prevent movement of snails include the use of a strip of bare soil around the crop, a fence that consists of a screen of corrugated tin or security wire mesh. Chemical control: Metaldehyde and/or calcium arsenate were used in early attempts to control A. fulica. A number of new molluscicidal chemicals are now available. The principal toxic effect of metaldehyde is through stimulation of the mucous glands, which cause excessive sliming, leading to death by dehydration; metaldehyde is toxic to slugs and snails both by ingestion and absorption by the ‘foot’ of the mollusk (Prasad et al. 2004). Sodium chloride (common table salt) is an effective dehydrating agent (Prasad et al. 2004). Various molluscicides like metaldehyde are non-selective, thus their use has a chance of endangering the survival of non-target snails, including endemic fauna (Prasad et al. 2004). Please see section 2.1.3 of Barker and Watts (2002) for information on the application of molluscicides. There is much interest in naturally occurring chemicals as molluscicides. Panigrahi and Raut (1994, in Raut & Barker 2002) have demonstrated that an extract of the fruit of Thevetia peruviana has activity against A. fulica. Prasad and colleagues (2004) found natural softwood cutting fences made of alligator apple (Annona glabra) acted as snail repellents to protect the nursery beds. Biological Control: rosy wolfsnail (Euglandina rosea) has been introduced throughout much of the introduced range of A. fulica in “biological control programmes” (Mead 1961, Tillier & Clarke 1983, Murray et al., 1988, in Gerlach 2001). The failure of these programmes and the devastating effect that E. rosea has had on many indigenous species is well known (Tillier & Clarke 1983, Clarke, Murray & Johnson 1984, Hadfield 1986, Murray et al. 1988, Cowie 1992, Pearce-Kelly, Clarke & Mace 1994, Coote et al. 1999 2000, in Gerlach 2001). Generalist predators such as E. rosea, Gonaxis quadrilateralis and Platydemus manokwari continue to be dispersed to new areas in misguided attempts to control this invasive gastropod. Informations on Achatina fulica has been recorded for the following locations. Click on the name for additional informations. Borrero, F.J., A.S.H. Breure, C.C. Christensen, M. Correoso & V.M. Avila. 2009. Into the Andes: Three new Introductions of Lissachatina fulica (Gastropoda, Achatinidae) and its Potential Distribution in South America, Tentacle 17. Budha, P.B. & F. Naggs. 2008. The Giant African Land Snail Lissachatina fulica (Bowdich) in Nepal, The Malacologist 50: 19. Civeyrel, L. and Simberloff, D. 1996. A tale of two snails: is the cure worse than the disease? Biodiversity and Conservation 5: 1231-1252. Connor, R.A. 2007. The Case of Achatina fulica and its impact in Anguilla, In: Anguilla Invasive Species workshop report. Cowie, R. H. 2000. Non-indigenous land and freshwater molluscs in the islands of the Pacific: conservation impacts and threats. In G. Sherley (ed.) Invasive species in the Pacific: a technical review and regional strategy. South Pacific Regional Environment Programme, Samoa: 143-172. Cowie, R. H. 2001. Can snails ever be effective and safe biocontrol agents?. International Journal of Pest Management 47: 23-40. Summary: Discusses the use of land and freshwater snails as biological control agents against other snails and against aquatic weeds. Recommends snails not be used for biocontrol. Craze, P.G. & J.R. Mauremootoo. 2002. A Test of Methods for Estimating Population Size of the Invasive Land Snail Achatina fulica in Dense Vegetation, Journal of Applied Ecology 39(4): 653-660. Desinfesta��o e Controle do Caramujo Africano. Undated. Summary: Text in Portuguese. Basic translation available. Hoddle, M.S. 2004. Restoring Balance: Using Exotic Species to Control Invasive Exotic Species, Conservation Biology 18(1): 38-49. Mead, A. R. 1961. The giant African snail: a problem in economic malacology. Chicago, University of Chicago Press. Mead, A. R. 1979. Pulmonates volume 2B. Economic malacology with particular reference to Achatina fulica. London, Academic Press. Summary: Update of Mead 1961. Meyer, W.M. & A.B. Shiels. 2009. Black Rat (Rattus rattus) Predation on Nonindigenous Snails in Hawai�i: Complex Management Implications, Pacific Science 63(3): 339-347. Prasad, G.S., D.R. Singh, S. Senani & R.P. Medhi. 2004. Eco-friendly way to keep away pestiferous Giant African snail, Achatina fulica Bowdich from nursery beds, Current Science 87(12). Raut, S.K. & G.M. Barker. 2002. Achatina fulica Bowdich and Other Achatinidae as Pests in Tropical Agriculture. In: Barker (Ed.) Molluscs as Crop Pests. CABI. Simberloff, D.& L. Gibbons. 2004. Now you See them, Now you don t! � Population Crashes of Established Introduced Species, Journal Biological Invasions 6(2): 161-172. Thiengo, S.C., F.A. Faraco, N.C. Salgado, R.H. Cowie & M.A. Fernandez. 2007. Rapid spread of an invasive snail in South America: the giant African snail, Achatina fulica, in Brasil, Biol Invasions 9: 693-702. Walker, K. 2006. Giant African Snail (Achatina fulica) Pest and Diseases Image Library. Updated on 13/02/2006 9:44:47 AM. Albuquerque, F.S., M.C. Peso-Aguiar, M.J.T. Assun��o-Albuquerque. 2008. Distribution, feeding behavior and control strategies of the exotic land snail Achatina fulica (Gastropoda: Pulmonata) in the northeast of Brazil, Braz. J. Biol. 68(4). Alicata, J.E. 1966. The presence of Angiostrongylus cantonensis in islands of the Indian Ocean and probable role of the giant African snail, Achatina fulica in dispersal of the parasite to the Pacific Islands, Can. J. Zool. 44(6): 1041-1049. Cowie, R.H. & A.C. Robinson. 2003. The decline of native Pacific island faunas: changes in status of the land snails of Samoa through the 20th century, Biological Conservation 110(1): 55-65. Cowie, R.H. & J.A. Grant-Mackie. 2004. Land Snail Fauna of Mé Auré Cave (WMD007), Moindou, New Caledonia: Human Introductions and Faunal Change, Pacific Science 58(3): 447.
de Paiva Barcante, J.M., T.A. Barcante, S.R.C. Dias, W. dos Santos Lima. 2005. Occurrence of Achatina fulica Bowdich 1822 (Mollusca: Gastropoda: Achatinoidea) in Minas Gerais State, Brazil, Bol. Mus. Biol. Mello Leitao (N. Ser.) 18: 65-70.
de Vasconcellos, M.C. & E. Pile. 2001. Occurrence of Achatina fulica in the Vale do Para�ba, Rio de Janeiro state, Brazil, Rev. Sa�de P�blica 35(6). Gargominy, O. (Ed.). 2003. Biodiversit� et conservation dans les collectivit�s fran�aises d outre-mer. Comit� fran�ais pour l UICN, Paris. Summary: Synth�se sur la biodiversit� des �les fran�aises d outre-mer et les enjeux de conservation. Gerlach, J. 2001. Predator, prey and pathogen interactions in introduced snail populations, Animal Conservation 4: 203-209. Graeff-Teixeira, C. 2007. Expansion of Achatina fulica in Brazil and potential increased risk for Angiostrongyliasis, Transactions of the Royal Society of Tropical Medicine and Hygiene 101 (8): Pages 743-744. Kekauoha, W. 1966. Life history and population studies of Achatina fulica. The Nautilus 80: 3-10, 39-46. Summary: Observations of fecundity, breeding season, growth rate, etc. Kliks, M.M., K. Kroenke & J.M. Hardman. 1982. Eosinophilic Radiculomyeloencephalitis: An Angiostrongyliasis Outbreak in American Samoa Related to Ingestion of Achatina fulica Snails, Am. J. Trop. Med. Hyg. 31 (6): 1114-1122. Martinez-Escarbassiere, R., E.O. Martinez & O. Castillo. 2008. Geographic distribution of Achatina (Lissachatina) fulica (Bowdich, 1882) (Gastropoda- Stylommatophora-Achatinidae) in Venezuela, Memoria 68(169): 93-106. Mead, Albert R. 1961. The Giant African Snail The University of Chicago Press. Chicago. 257 pp. Meyer, J.-Y. & Picot, F. 2001. Achatines attack! The impact of Giant African land snails on rare endemic plants in La R�union Island (Mascarene Is., Indian Ocean). Aliens, 14, 13-14. Meyer, W.M., K.A. Hayes & A.L. Meyer. 2008. Giant African snail, Achatina fulica, as a snail predator, American Malacological Bulletin 24(1): 117-119. Summary: Base de donn�es en ligne sur le patrimoine naturel fran�ais. Neuhauss, E., M. Fitarelli, J. Romanzini & C. Graeff-Teixeira. 2007. Low susceptibility of Achatina fulica from Brazil to infection with Angiostrongylus costaricensis and A. cantonensis, Mem. Inst. Oswaldo Cruz 102(1). Ohbayashi, T., I. Okochi, H. Sato, T. Ono & S. Chiba. 2007. Rapid decline of endemic snails in the Ogasawara Islands, Western Pacific Ocean, Appl. Entomol. Zool. 42(3): 479-485. Simbiken, N. 2006. Personal Communication. Senior Entomologist, PNG Coffee Research Institute. Summary: Email communication from PestNet. Thiengo, S.C., M.A. Fernandeza, E.J.L. Torresb, P.M. Coelhoa & R.M. Lanfredib. 2008. First record of a nematode Metastrongyloidea (Aelurostrongylus abstrusus larvae) in Achatina (Lissachatina) fulica (Mollusca, Achatinidae) in Brazil, Journal of Invertebrate Pathology 98(1): 34-39. Vermeij, G.J. 2005. Invasion and evolution: Why do herbivorous and carnivorous land snails invade but not originate on islands?, American Malacological Bulletin 20(1-2).